Allie has written for Mommy’s Busy Go Ask Daddy before when she made the cutest and most deliciousest SpongeBob Krabby Patty Cupcakes. She did such a great job, that I knew I’d have to have her on here again. Besides baking the bestest cakes in the universe, she’s also insanely amazing at putting together Halloween costumes. Yeah, for someone with a science background, she’s really pretty darn artistic. Now when it comes to Halloween, Jason’s always the tough one. 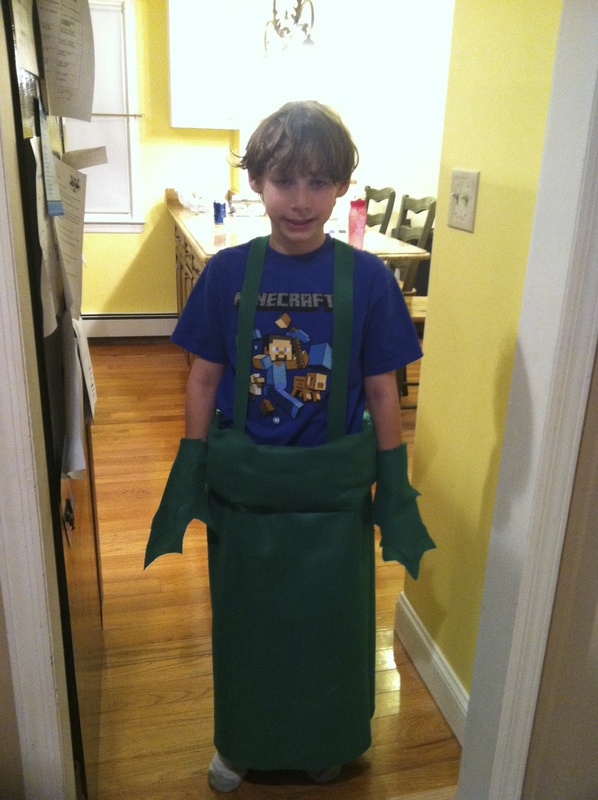 He never knows what he wants to dress up as and it’s almost always some insanely crazy obscure video game or Pokemon type character. That means no costume exists for it, so Allie’s stuck making it. And with just her trusty glue gun, lots of cloth and a killer imagination, she always comes through! 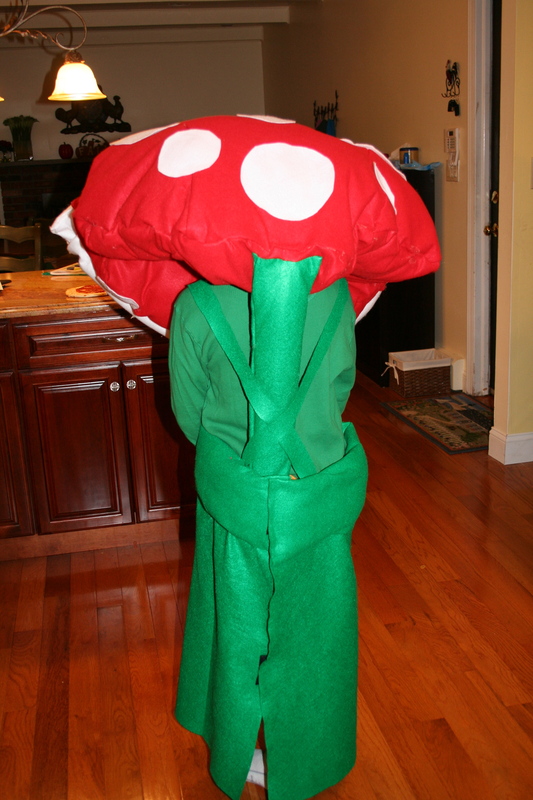 A few years ago she made the most adorable Yoshi costume for him. And this year, well, I think she topped it. I’ll let her take over now. Last week, my 10-year-old son, Jason, finally told me what he wanted to be for Halloween (even though I have been asking him since August). 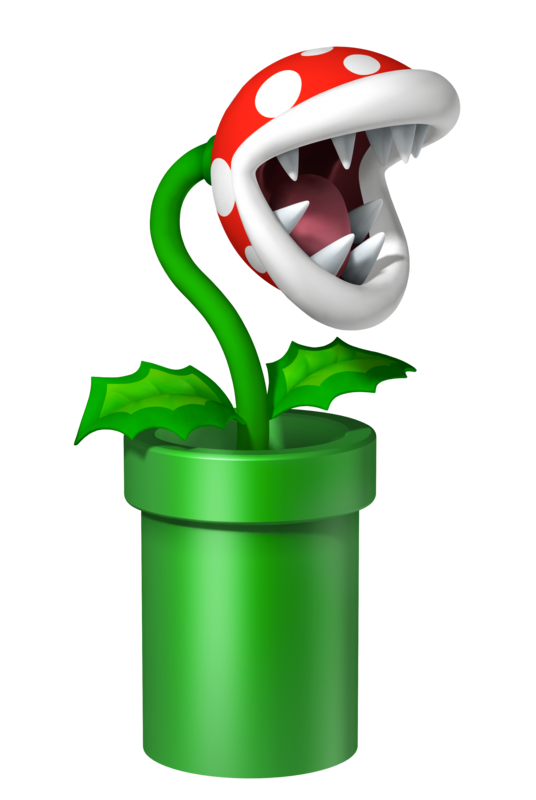 This is what he asked for… a piranha plant in a pipe from the Super Mario Bros. games. Off to JoAnn’s Craft Store I went. When I got there, I was pleased to find that felt was on sale for $2.99 a yard (that is really cheap)! 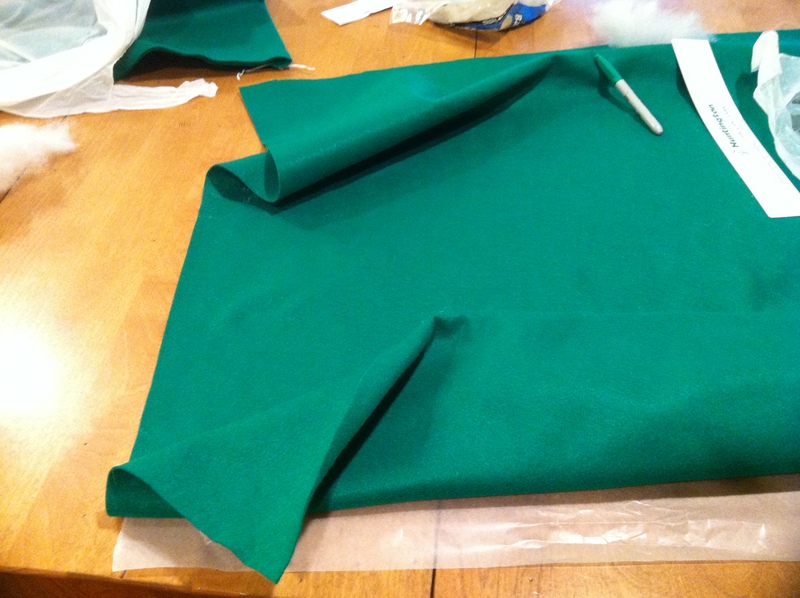 I got 3 yards of green, 1/2 yard of red and 1 yard of white felt. It came out to $17 total. I thought I got away very cheap for a homemade costume! 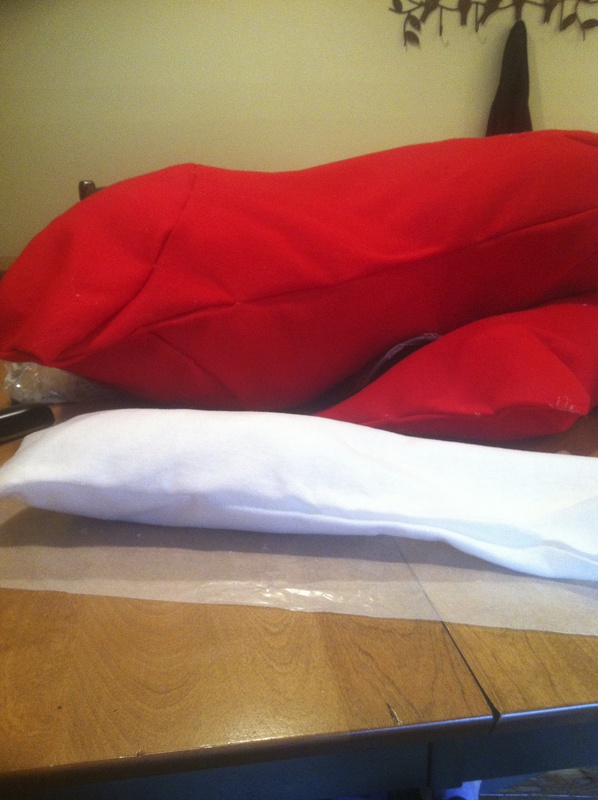 I already had a glue gun,Velcro and polyester stuffing at home from previous projects. (Don’t ask.) 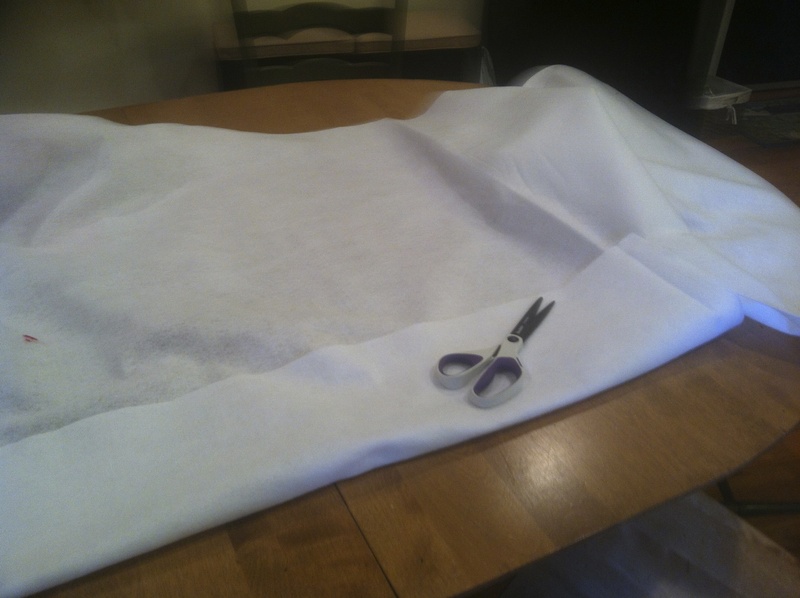 I use a glue gun because I think it is faster than sewing and also, I don’t know how to sew well. 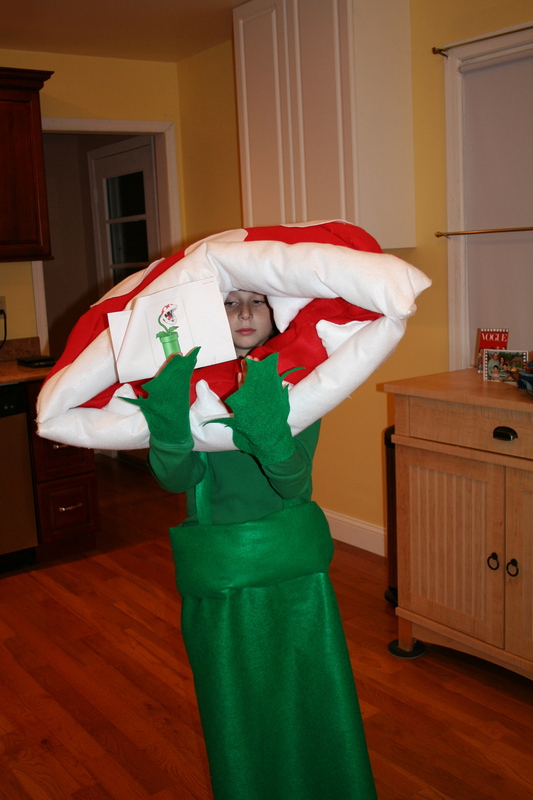 When I got home, I went online and looked up other people’s piranha plant costumes. As Issac Newton once said, “If I have seen further than others, it is by standing upon the shoulders of giants.” I needed to see how others did it before I could make mine. Right away, I saw a costume with suspenders, which I thought was a brilliant way to hold up the bottom part of the costume. 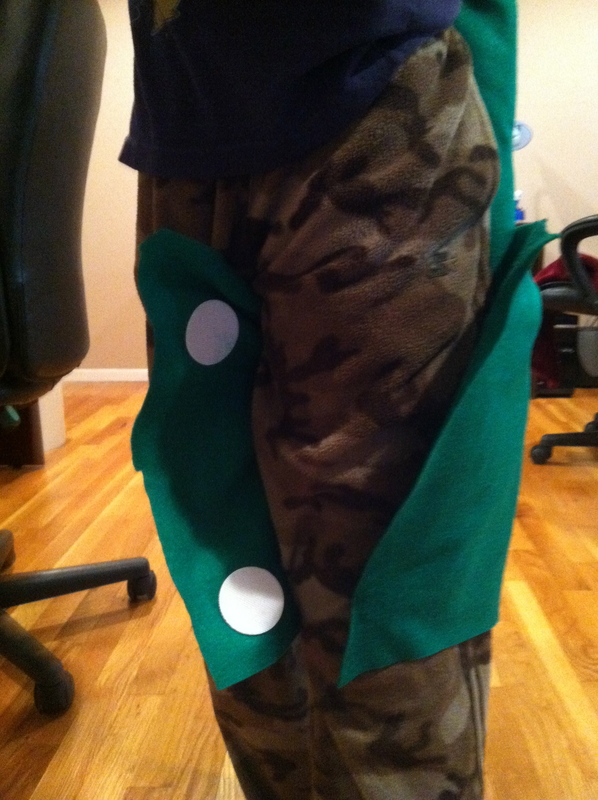 In about an hour, I was able to get the pipe and leaves (bottom part of costume) done. I wrapped the material around Jason’s (the costume requester) waist and left a little room to give the appearance that he is coming from inside the pipe. I then folded the top piece about 8 inches to create the top lip. 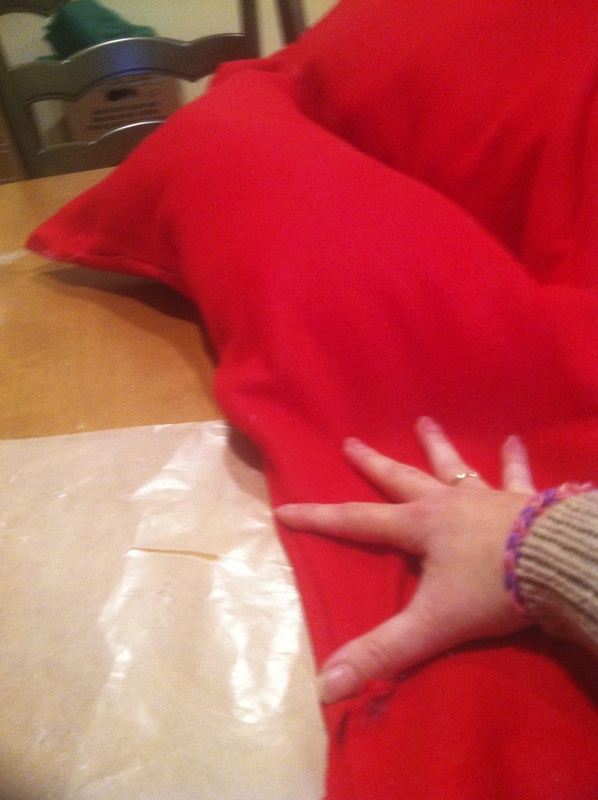 As I was gluing the top piece, I also stuffed it with polyester stuffing. 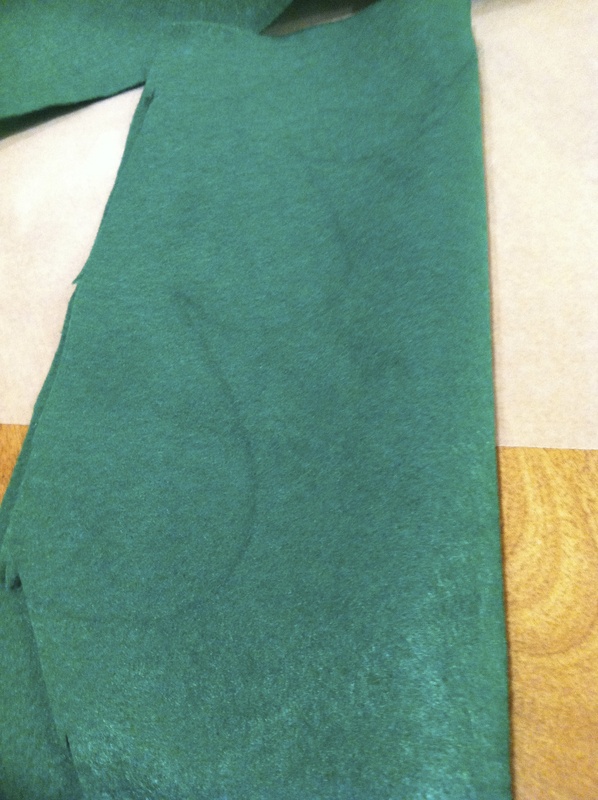 Once that was finished, I cut out two strips of green felt as the suspenders, measuring them against Jason’s body. I glued both strips onto the back of this pipe and used Velcro to connect the front part. For the leaves, I simply drew freehand leaf shapes. 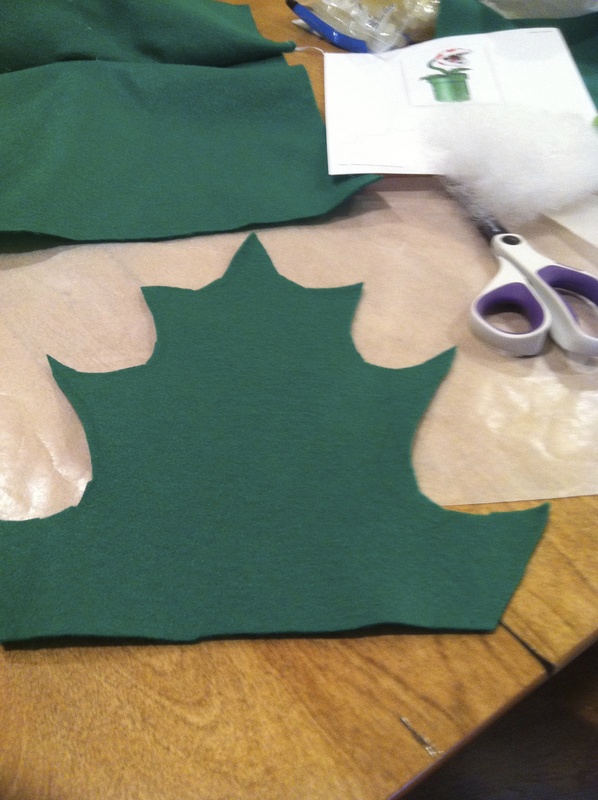 I made a thick band on the bottom of the leaf so it would wrap around his wrists, glued another layer of leaf, added Velcro and I was done. Here comes the hard part. I had no idea how to make the head! The top part of the head consisted of three sections that I stuffed and glued together. 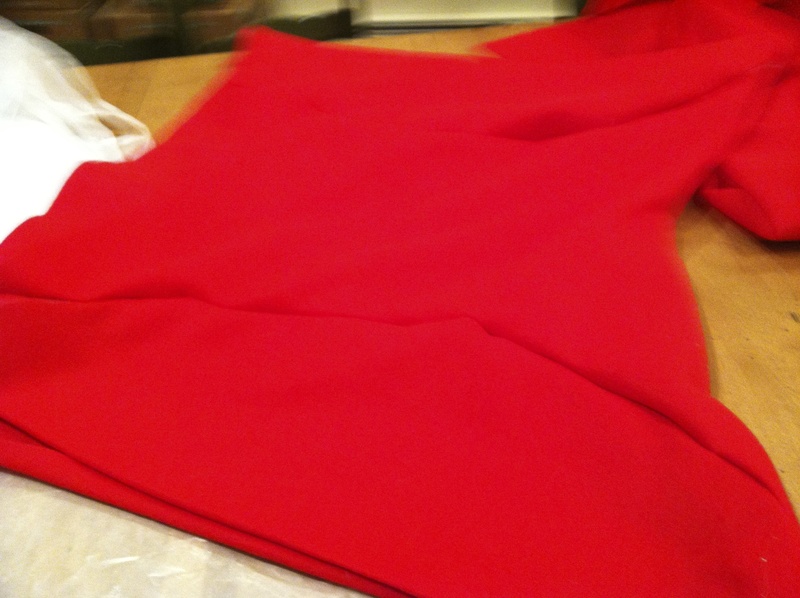 This was the top part and then I made a duplicate for the underside and then stuffed it. This is still for the top part of the helmet, as I didn’t do the hinge part yet. It ended up sooooo heavy and big that I actually trimmed the sides after it was glued, took out some stuffing and glued the sides back together. Now it’s time to add the hat. This was pretty easy. I figured out where the middle part of this section was. 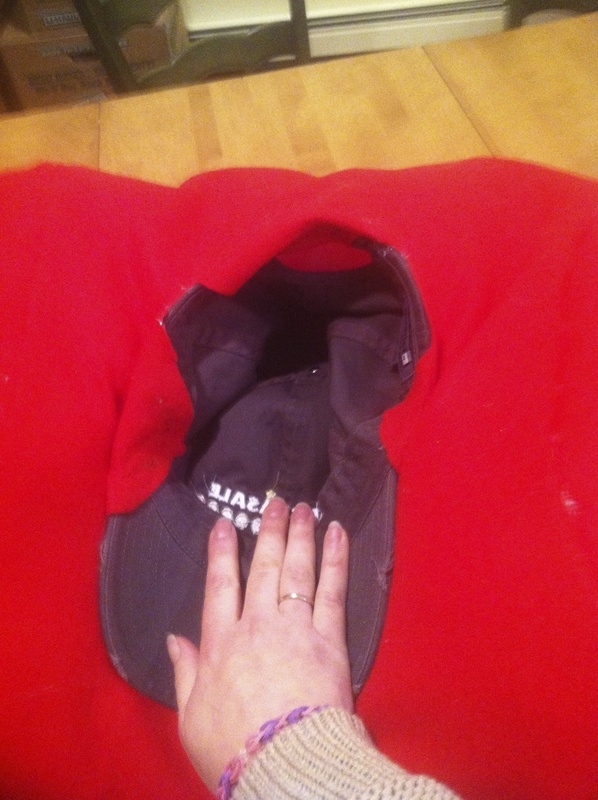 I cut out a hole and glued in the hat. And yeah, I took out even more stuffing to make it lighter, again. Now came time for the hinge (bottom part). I cut out a curved portion of material to match the length of the top part. This was more tubular and I just glued and stuffed it. 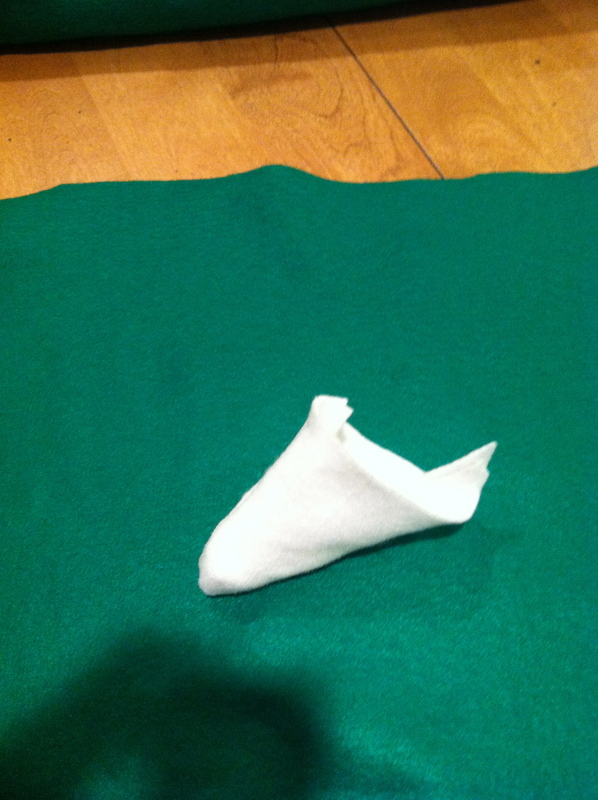 To make the white lips, I cut on a long piece of white felt and folded it over, stuffed and glued it. I measured it against the red head to get the correct length. 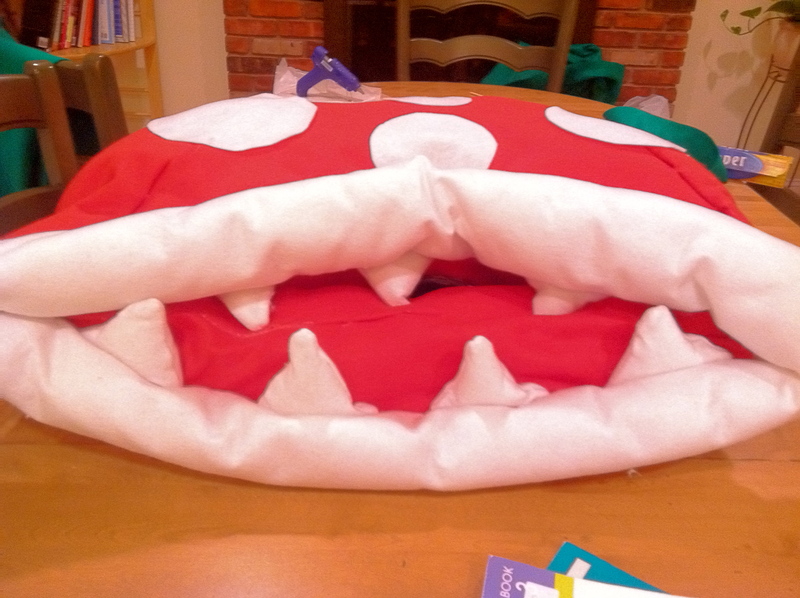 After the lips were done, I just glued them seam side down on the red parts. To make the spots, I just drew circles on the white felt and cut them out. Next, I glued them on with the glue gun and was done. 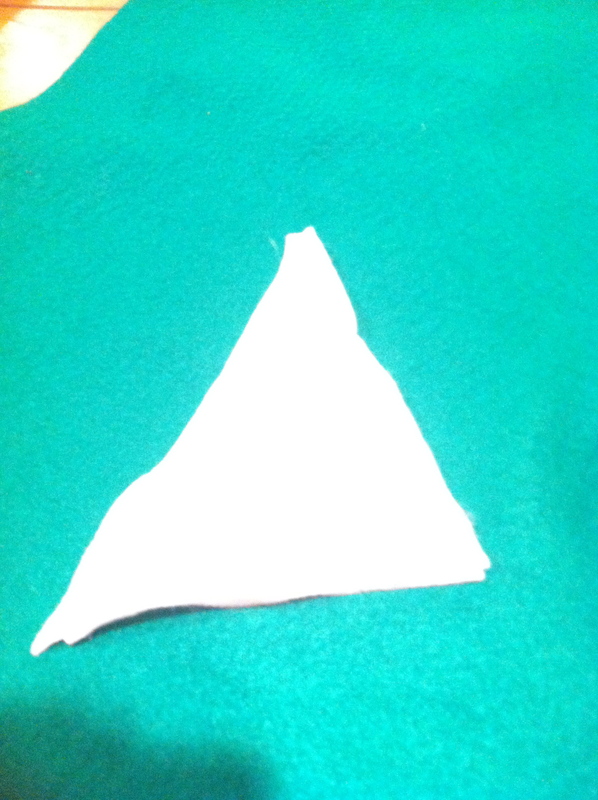 To make the teeth, I drew triangles on a folded sheet of white felt, cut them out and glued two out of the three sides. 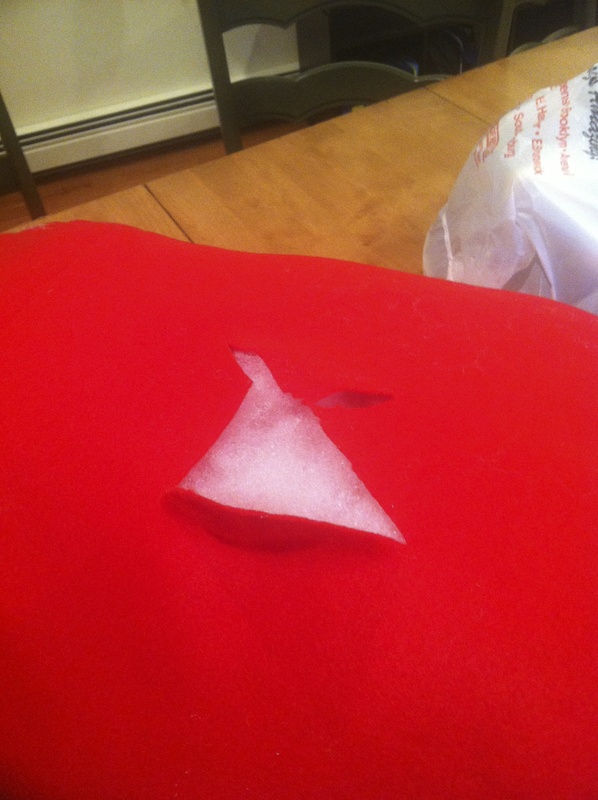 Once the glue was dried, I pulled the triangle inside out (so you won’t see the seams), stuffed and glued them down. To glue both parts of the helmet together, I put velcro on just to gauge where to place the glue. The glue gun glue is surprisingly very strong. Here is a picture of it sitting on my table. There wasn’t supposed to be a Step 10, but I found out the headpiece was leaning forward because of the extra weight with the lips and bottom hinge. My wonderful husband, Andrew [Editor’s Note: She actually wrote that of her own free will! – Andrew], thought of bracing it in the back somehow. Since it was plant, I thought why not brace it with a stem? I quickly got a piece of green felt, stuffed and glued it to the red head piece. The question now was where to attach it (You can see I put Velcro on the bottom of the stem). At first I attached to the inside of the pipe but it made the pipe bunch up in the back. So instead, I made a garter (for lack of a better word) to put around Jason’s leg, which will act as the attachment point for the stem. I ran to Walmart, got a green T-shirt and was finally done two weeks later. Here is the finished product! His favorite part was the leaf hands! 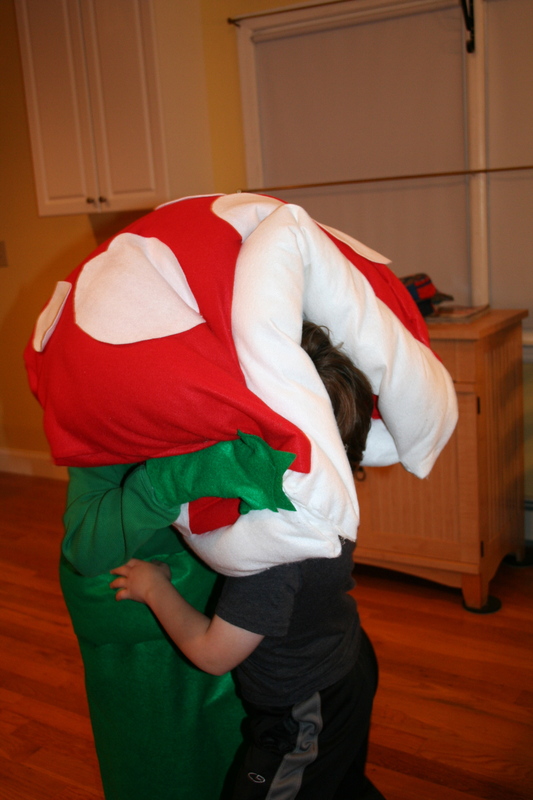 Lastly, Jason doing what any piranha plant would do: eat his little brother!! Thank you very much for posting the info. Created a similar costume for my son. If nothing else, your suggestion to use felt and a glue gun was fantastic and I’m sure I wouldn’t have managed without your guidelines. Kudos!!! Glad to hear it! Would love to see what you came up with! How cute is that??? Love it! I must not have a creative bone in my body… I could never think up something like that…….. I LOVE that last pic of eating the younger one…..this is so true to real life. Though my young one is just as aggressive as the older one. Awesome costume, really creative! OMG, this is amazingly cool. He looked so adorable too. Thanks for the step by step. i just might make this for hubby next year. Looks like a LOT of work…but WAY cool! This is a costume that should be handed down in the family, like new Prince George’s christening outfit. wow, this is great! really cool tutorial! This is so neat. My 5 year old loves everything Mario. I’ll keep this in mind for next Halloween! Wow! What a great costume! My son would love this! Wow, such talent you have. I could never make a homemade costume but would love to. The details and everything you put into it, way to go!!! I agree, costume contests, go enter!!! This is great! I love homemade costumes, and you are so skilled! Hope he has a great Halloween. Kimberly recently posted..That College Book Costs WHAT? I Love it!!! How cute is that? I would much rather have a hand made costume instead of a store bought one. I made all of my son’s costumes before he became to “cool” for Halloween. 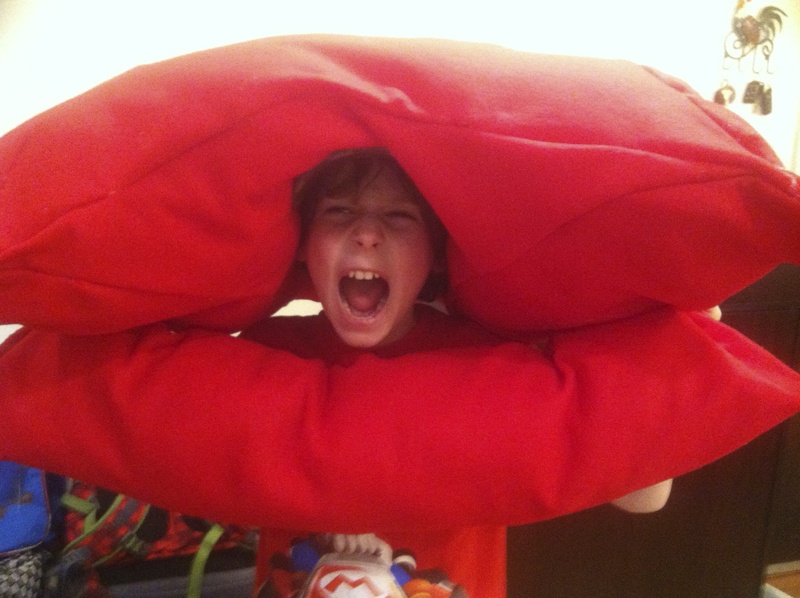 When we went to the Halloween party, all of the adults thought he was the plant from Little Shop of Horrors! All of the kids knew exactly who he was, of course. bha ha ha love it! where’s luigi? Oh my gosh, you are so talented! The last picture had me cracking up. What a great costume! 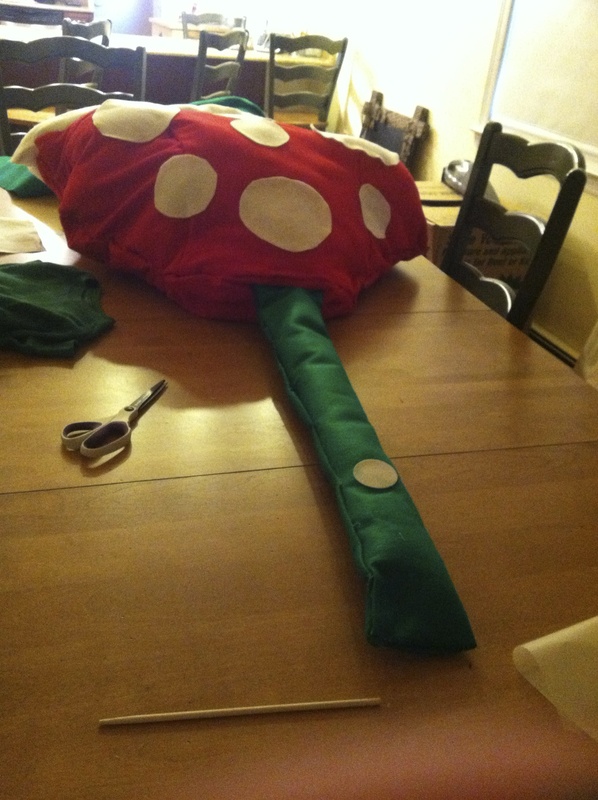 I was a Mario fan when being a fan wasnt cool so Ilove the costume but I dont think Im talented enough to make it. I think a cool add on would be the sound effect from the game, from your phone or tape or something. This is completely awesome! I’m a HUGE Mario Fan and i’m slowly corrupting my oldest son (he’s 5) I definitely love this and think you did an amazingly awesome job!!! 10 stars!!! Definitely pinning this for later use!! This is a cool costume, and the price is right! 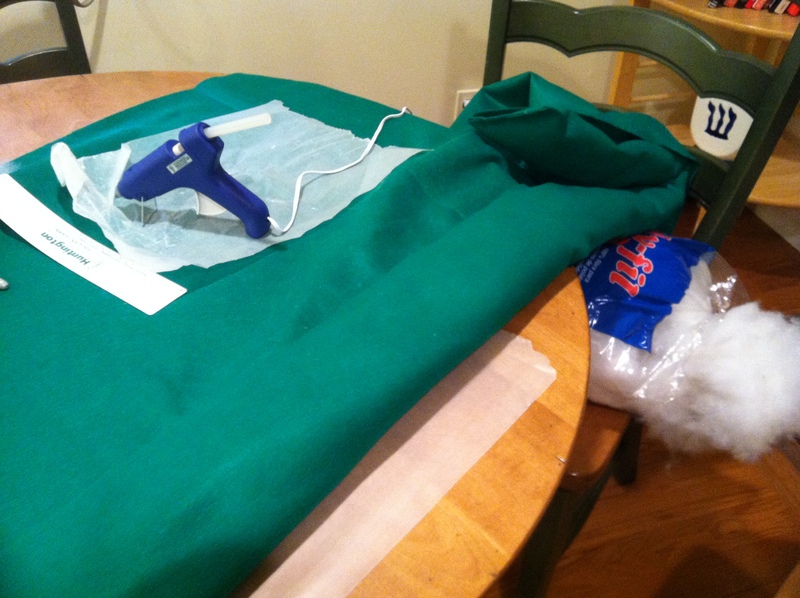 With some costumes costing around $50 it is great to find a way to save a little money. Awesome Costume!! 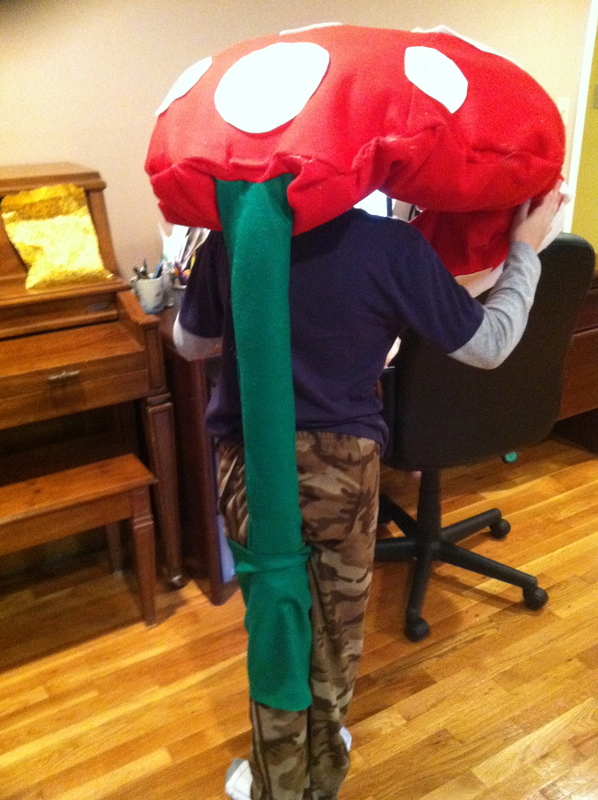 My son would love a costume like this… GREAT JOB!! Great costume ! You guys did a really nice job. Oh my goodness, this is the best costume and so original! I love that you made it yourself! My son in law, who grew up playing Mario games, would love this! What a unique idea. I love it. Looks easy enough to do too. That is hilarious and awesome on so many levels. Enter that kid in some local costume contests. I am in love!!! Great job. What a lucky kid and a creative idea for the costume as well. I love out of the box ideas. This is such a cute idea. I love how easy you made it to follow with the step by step guide and great photos. This is a cool costume. I pinned it to my Halloween board. How fun is that costume! My boys would love it and I like that it’s inexpensive to make too. Thank you for sharing! Wow, that is really cool Allie. You have some talent! My in-laws made a couple Minion costumes that are pretty darn amazing for my kids, I’m gonna have to post something similar. Although it will have to be for next Halloween as they have been working on it since August…or so it seems! That is fantastic. I always appreciate a good homemade costume over store-bought any day. This is so awesome!! Seriously one of the best homemade costumes I have ever seen! How incredibly cute is that?! And at $17 for materials, plus the green shirt, that’s a bargain. Some of those cookie cutter costumes cost way more and they just look cheap. 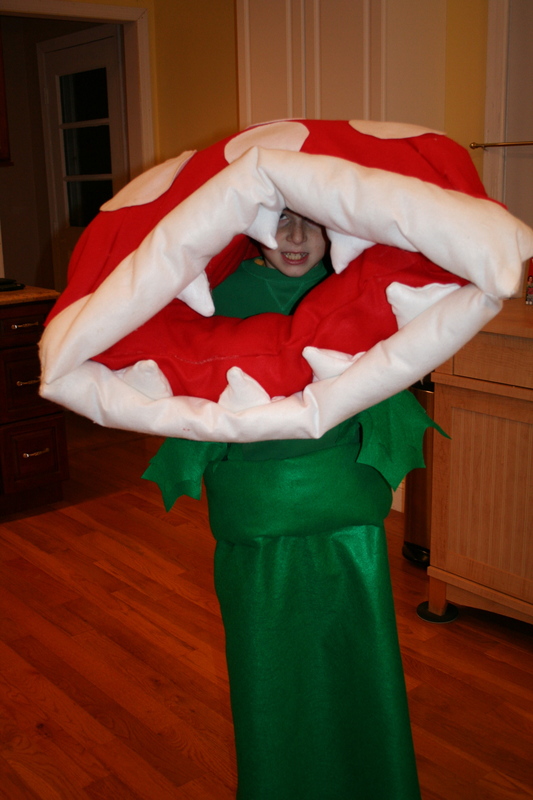 He’s definitely the coolest Piranha Plant I’ve ever seen.